The top two rival candidates to lead the European Commission struggled Wednesday (9 April) to find real policy differences in the first live television debate ahead of European Parliament elections next month. Centre-right Jean-Claude Juncker and Social Democrat Martin Schulz – whose native languages are Luxembourgish and German – argued politely in French over the appropriate balance between budget austerity and investment to promote economic growth, in a 50-minute debate on France 24. But they agreed far more often than they disagreed, expressing a pro-European consensus that may be exploited by anti-EU populists of the far right and hard left, who blame policies made in Brussels for the continent’s economic crisis and mass unemployment. Juncker, 59, the veteran former Luxembourg prime minister and chairman of euro group finance ministers, stressed the need to maintain tight control of public finances, and said he could see no grounds to give France more time to reduce its deficit. “France has already had two extensions to its period of adjustment. A priori, there is no obvious reason why it should get a third one,” he said, while noting that the European authorities would study France’s budget plans before deciding. Schulz, 58, the outgoing president of the European Parliament, hit back, saying new French Prime Minister Manuel Valls had announced a courageous and ambitious reform programme in parliament on Tuesday. “If he needs support from the European Commission, he should get that support,” the Socialist candidate said, noting that France is the euro zone’s number two economy and was now ready to make necessary economic reforms. France has promised to bring its budget gap, now at 4.3 percent of national income, below the EU treaty limit of 3 percent by the end of 2015. But the new government has hinted it will seek a slower pace of deficit reduction to preserve growth. Schulz said Juncker, and other mostly conservative leaders in charge of the European institutions at the outbreak of the debt crisis, had misdiagnosed the problem by prescribing strict austerity, forcing millions out of work. “This theory that unilateral spending cuts would restore investors’ confidence manifestly didn’t work. We have had to change course in recent years,” he said. Europe needed more strategic investment in research, education and innovation to get 28 million unemployed EU citizens, including more than half of young people in some countries, back to work, he added. Both described Germany as the most successful economic model for Europe. Both said Europe should do more to welcome legal immigrants, and that it was up to national government to prevent any abuse of their welfare systems by migrants. Schulz and Juncker also sought to take account of British demands to repatriate some powers to member states, and stop the EU intervening unnecessarily in citizens’ daily lives. As Juncker put it, Europe should be “big in big things and small in small things”. Schulz said he would write to all EU civil servants, urging them to stop thinking about how they could intervene in every corner of the EU, but about what could better be done locally, instead of centrally. The European Parliament insists that the leader of the political group that wins the most seats in the May 22-25 direct elections in the 28 member states should be chosen to lead the executive Commission. However, the EU treaty says it is up to the European Council of national leaders to nominate a candidate taking account of the elections and after holding consultations. With eurosceptic Britain, and some others opposed to both Juncker and Schulz, seen as old-style European federalists, it is not clear whether either will get the nomination. Schulz countered by saying that the European Parliament had warned EU leaders from the start of the crisis that their policy mix was wrong. European parties’ single candidates for the next European Commission presidency will face each other in televised debates in the weeks preceding the EU elections on 22-25 May. Apart from Schulz and Juncker, the debates are expected to involve the liberal candidate Guy Verhofstadt, the two Green candidates Ska Keller and José Bové and the candidate of the Party of the European left Alexis Tsipras. One debate in particular is due to galvanise attention on mainstream parties and possibly boost turnout. The European Broadcasting Union (EBU), the alliance of public service media across Europe, is looking into organising two debates at the European Parliament in Brussels on 15 and on 20 May. The two debates are dubbed #TellEUROPE. EBU is exploring how it can get its members to air the presidential debates across European countries. The Dutch Maastricht University also intends to hold a debate, on 28 April. Other organisations are still looking into holding debates in Brussels and in Florence, Italy. 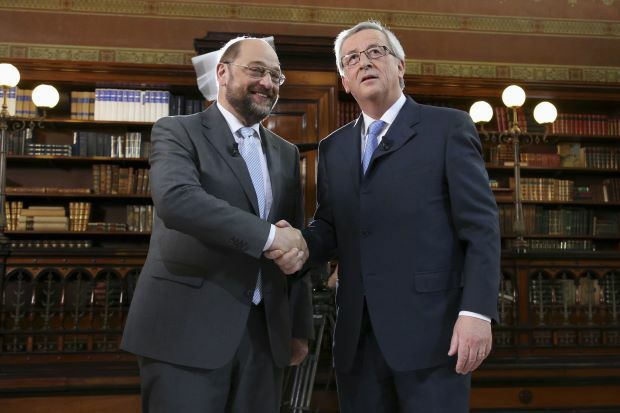 Jon Worth : At least 4 TV debates between Schulz and Juncker, more to come ? Yet more ex ministers from countries who benefit directly from the growing EU bureaucracy feeding that same bureacracy. So when we vote there is no differnce for who we will vote? It is clear that the European Project has been in trouble since the NO votes in 2005 and seems to command less and less support throughout north west Europe. Yet there seems little attempt at fundamental re-thinking.